Overlooks.tv cultivates site-specific ambient video walls, aimed at transforming private and public spaces into here-but-elsewhere experiences. Our visual storytelling video installations provide a wow effect that converts your business or event into a powerful STORY MAKER and your audience into revved-up STORYTELLERS. overlooksTV is headed by Shlomi Ron, a senior visual marketing executive with over 20 years of experience translating products and services into rich brand experiences. 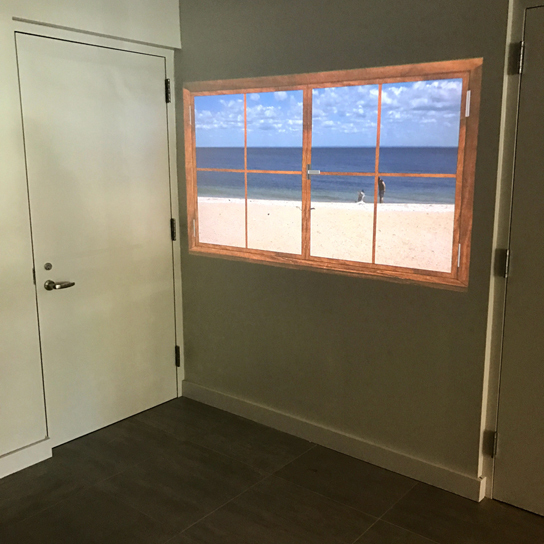 This ambient video installation features a life-size virtual window through which a natural landscape of a serene beach serves as the stage for a poetic narrative. The symmetric dynamic of the minimalistic waves motion, the lounging lone seagull, and the encroaching young couple – creates a meditative visual experience that transforms the physical space from right here to imaginative there while engaging audiences in immersive dialogs with their surroundings. This natural vista demands viewers to look out the window to process the visual narrative and then look in, to process its objective and subjective meanings. The result is a surprising redefinition of the space ambiance into a powerful story maker and the audience into revved-up storytellers. Alternatively, you can schedule a conversation with us. Copyright 2017 overlooksTV - All rights reserved. Proudly made in Coral Gables, FL.